European launch the same day as the Americas. Persona 5 will launch physically and digitally for PlayStation 4 and PlayStation 3 in Europe on February 14, publisher Deep Silver announced. In the Americas, Persona 5 will launch on the same date. Persona 5 will launch first in Japan on September 15. Persona 5 for PlayStation 4. Soundtrack: A selection of music from Persona 5 by legendary series composer, Shoji Meguro, in a CD sleeve featuring P5 artwork. 4” / 10 cm plush keychain: Morgana the Phantom Thieves’ cat is not just the mascot of the Phantom Thieves, but also a member – and also not just a cat! 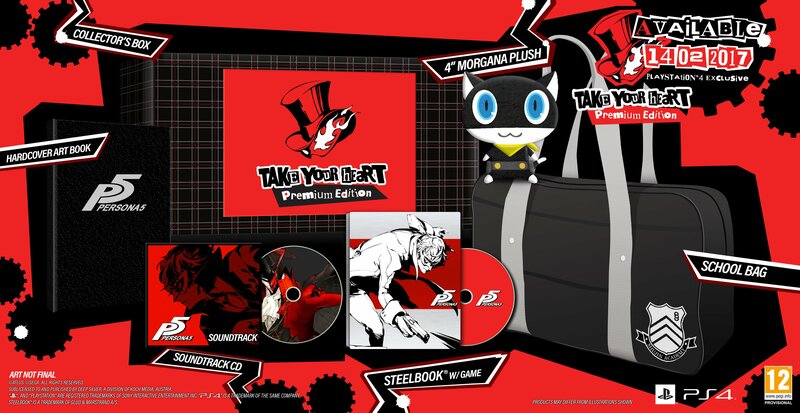 The premium edition includes an exclusive 4”/10 cm plush of Morgana. SteelBook game case: As strong as a vault, the game disc for the PS4 will come specially packaged in a metal game case, emblazoned with Persona 5 designs. The game will come specially packaged in a metal game case, emblazoned with Persona 5 designs. The PlayStation 3 version will only be available in a standard game case. Persona 5 is a game about the internal and external conflicts of a group of troubled high school students – the protagonist and a collection of compatriots he meets in the game’s story – who live dual lives as Phantom Thieves. They have the typically ordinary day-to-day of a Tokyo high schooler: attending class, after-school activities and part-time jobs. But they also undertake fantastical adventures by using otherworldly powers to enter the hearts of people. Their power comes from the Persona, the Jungian concept of the “self”. The game’s heroes realize that society forces people to wear masks to protect their inner vulnerabilities, and only by literally ripping off their protective mask and confronting their inner selves do the heroes awaken their inner power, and use it to strive to help those in need. Ultimately, the group of Phantom Thieves seeks to change their day-to-day world to match their perception and see through the masks modern-day society wears. View a set of European box arts at the gallery.